A book about a girl blogging about her life, discussing issues like periods, masturbation, boys and booze like they shouldn’t even be ‘issues’ to talk about? I’d been hoping for a really long time for Editing Emma to be released in India and when I got the opportunity to read and review it for Harper Collins India, I was BEYOND overjoyed! I finished Editing Emma in a mere two days (or should I say very busy evenings) and while at times, the book frustrated me, I did really like going on this journey with Emma through her blog posts. 1. After reading this book from end to end, I can HONESTLY say teenage girls are confusing and I AM A TEENAGE GIRL, so you could tell how confusing it was for me. I really liked Emma – she was honest and spunky and slightly irritating and I spent 330 pages immersed in her innermost thoughts and I came out of them confused. 2. In fact, even the boys confused me. (WAIT: IF I DON’T GET TEENAGERS, DOES IT MEAN I’VE GROWN PAST TEENAGER-DOM?) They were cute and charming and nice until they were needy and rude and GHOSTED GIRLS FOR NO REASON? 3. I actually think all the confusion that I’m talking about above just goes to show HOW ACCUTARELY the life of a high-schooler was portrayed. It felt real and it also annoyed me, and I laughed and felt for the characters. ESSENTIALLY, THIS BOOK CAPTURED EVERYTHING YOU FEEL AS A TEENAGER. 4. I REALLY like that this was told through blog posts. Essentially it was The Princess Diaries, but in the form of a blog and not a diary. 5. Emma’s sense of humour and sarcasm levels were OFF THE CHARTS, which was what made this book funny. There are resolutions and lists and awkward first text-versations with boys and also not to mention, a beheaded stuffed giraffe. I loved the hilarity of her life and her spin on it. 6. This book was about growing up and learning to love yourself in a world where nobody will let you. It was about finding your corner and your people and what’s important and it was done through a teenager which I TRULY applaud. An honest, unflinching and hilarious (if at times eye-roll worthy) coming of age book that should be added to the top of your ever growing TBRs. 4 stars and definitely worth a read! 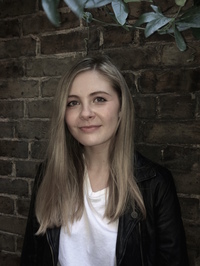 Chloe Seager grew up in London with her mum and her much loved cat, Katie. She studied English Literature and Drama at the University of East Anglia where she realised she couldn't act, but did rediscover her love of children's books. Children's literature was one of her favourite modules and it made her wonder why grown-ups ever stopped reading them. She now works with YA and kids' books full time. Chloe lives back in East London with her boyfriend and pet fish. 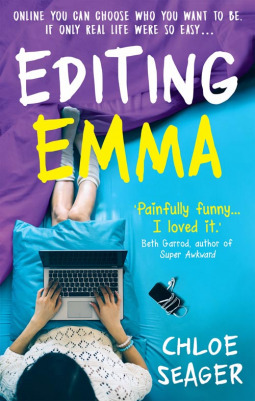 Have you had the chance to read Editing Emma yet? What did you think of it? Have you ever had a dairy/ blog/ some form of writing down what went on in your everyday life? How old were you then? I hope you guys check out Editing Emma because it's definitely worth the read!